On Sale Now! 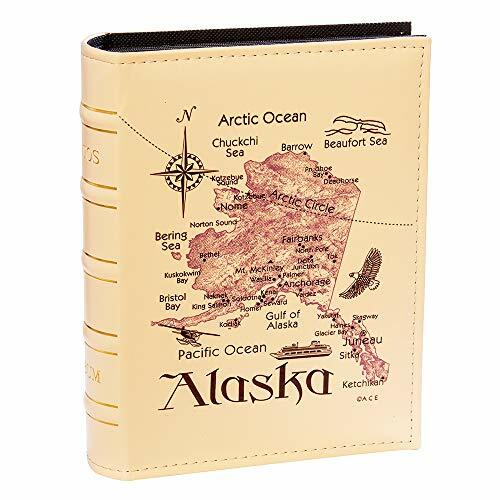 Save 9% on the Longpro Imitation Leather Photo Album Deluxe Series for Vacation Honeymoon Holiday Travel Souvenir(Alaska) by Longpro at Wow In The Details. MPN: L009. Hurry! Limited time offer. Offer valid only while supplies last. ♦PREMIUM MATERIAL: The material of cover is high grade leatherette, and of good hardness and stiffness.High capacity, Expandable PU Leather Cover. It makes the album with different style (or classic, or fashion, or simplicity, or vintage). Suitable for different ages, different gender, and people of different aesthetic.Suitable for holidays, honeymoons, various festivals, etc. It can also be used as a small gift for important occasions such as weddings and business meetings. ♦BEAUTIFUL LOOK: And inside, the sidekick design makes the album of primitive simplicity and beautiful. It is a great way for your photos'collection. Black inner page with transparent PP plastic pocket, strong and waterproof, and the outer page is a 3D touch Alaska map pattern cover.Normally the capacity is 200 photos. 50 sheets (100 pages).High capacity, ample space for you to keep hundreds of photos.Showing all your favorate photos forever. ♦KEEP PRECIOUS MOMENTS FOR YOU: This vintage and fashionable photo album will help you to keep all the precious moments in your life. Album size: 10.2 x 7.8 x 2.4 inches (26 cm x 20 cm x 6 cm). The best size of the photos is 4 "x 6" (10.2 x 15.2 cm).This photo album can be given to friends, children, teenagers and people who love outdoor sports and long-distance travel. ♦PERFECT GIFT IDEA: A nice choice for yourself, your friends, families and lovers as gift for Christmas, Valentine's Day Anniversary, Mother's Day, Birthday, personalized gifts,Thanksgiving day and so on.Or as a witness to good memories, give love to couples, newlyweds, etc., to storage important moments in life.The special design surely has a wonderful dustproof and waterproof function. Keep your common memories forever. ♦100% SATISFACTION GUARANTEED:Our fan-favorite 3-month warranty and friendly 7X24 hours customer service. If there any information for the leather photo album, Please feel free contact us. If you have any questions about this product by Longpro, contact us by completing and submitting the form below. If you are looking for a specif part number, please include it with your message.